Hi there, I have a pretty card to share with you today that I made with new CHA goodies you can get at Scrap-mart. Today's card is all about my wonderful designer friend, Samantha Walker. She amazes me with all her gorgeous creations and all the fabulous companies she works with, so today's card is using her products from different manufacturers. 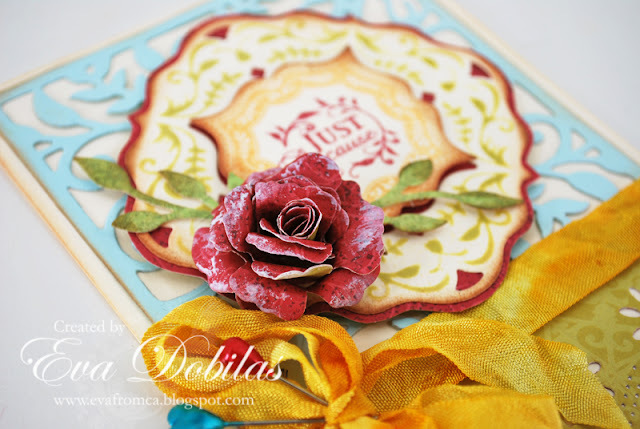 For this card I focused on her new Spellbinder dies and her brand new JustRite Papercrafts stamps. Samantha has always the most intricate designs and these are no different at all. For my card I used her new Spellbinders dies called Botanical Swirls. 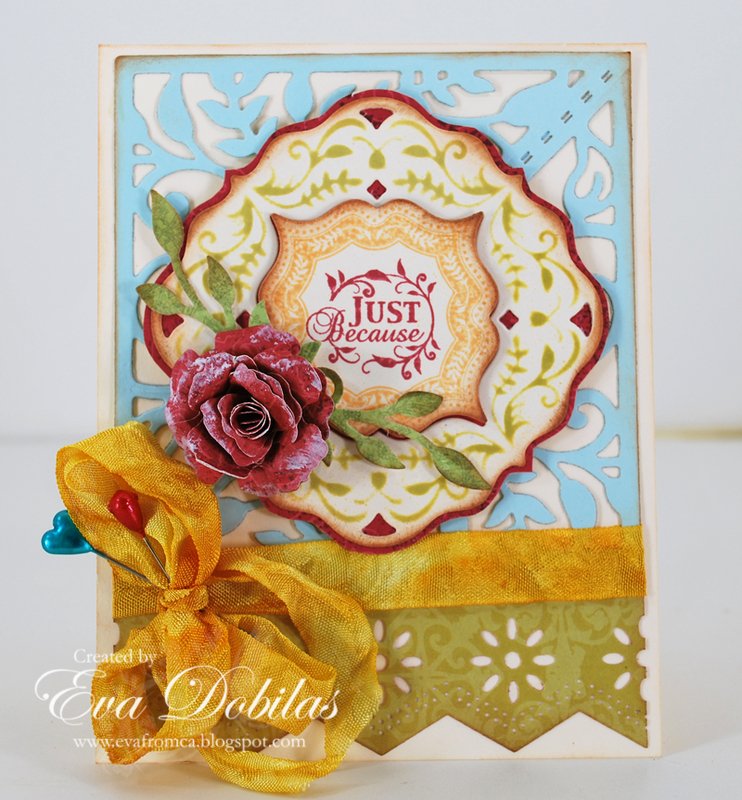 I used the gorgeous leafy corner piece to create my background with, which I did just by die cutting a square piece of card stock, then turned it around and placed my die, so it would line up and die cut it again to create a square piece. The large label was die cut out of cream paper, than while leaving the die on the card stock, turned it around and went over the raised parts with my Distress ink using the blending tool, that's how I got the green designs. Finally the I stamped my image on from the Botanical Swirls Labels JustRite Papercrafts stamp set onto the negative part of the label die. It's perfection! Oh and of course I had to use my pretty Spellbinders Bitty Blossoms dies, as I can't seem to be able to put it down...LOL. It fit perfect my card, so I went with it. Also the green piece of paper, which I die cut with the Spellbinders Decorative Insert Six is Samantha's patterned paper by Creative Imaginations called Ooh La La collection. And also the coordinating Botanical Swirls Labels JustRite Papercrafts stamps. Well, that is it for today. Hope you enjoy the card I created and make sure you check out Scrap-mart for some awesome deals for you scrappy wants. Thanks for stopping by and have a wonderful day!